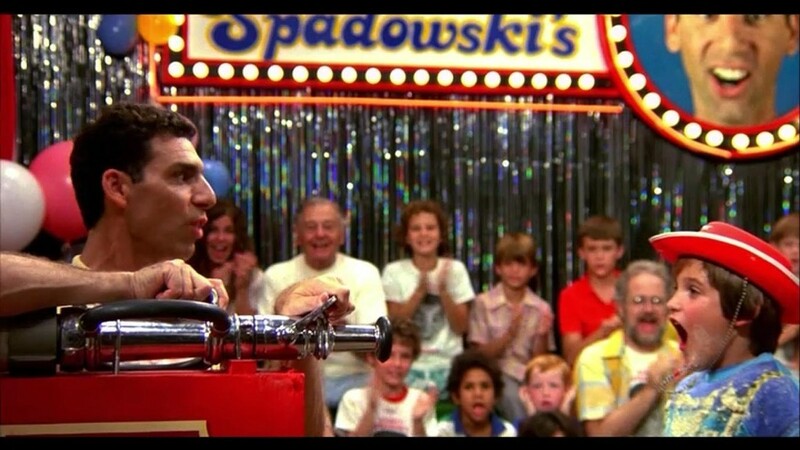 A pre-fame Michael Richards as Stanley Spadowski in UHF. “Weird Al” Yankovic has created and maintained his star image with unusual savvy, cultivating the persona of a clever, good-natured goofball who never has an unkind word to say about anyone. Since 1983, he’s released 14 studio albums (and plenty of other musical ephemera); made 50-odd music videos, including some classics of the form; and appeared in an array of productions that includes “The Drew Carey Show,” Rob Zombie’s horror remake Halloween II and even “My Little Pony: Friendship Is Magic.” Yet he’s only starred in one film: 1989’s comedy UHF. UHF was a key feature of “The Rotation,” a group of a few dozen films that my high school friends and I would watch again and again. (Most of the others on that list were similarly goofy comedies such as Fletch, the various Monty Python films and the Naked Gun films [in all three of which Al plays a small part]. What can I say? We were nerdy.) UHF is highly quotable (“I’m thinking of something orange. Something ORANGE!”) and contains exactly the right amount of silliness to stand up to multiple viewings — whether the person doing the viewing is 16 or 42. The Rambo parody in UHF. What impressed me in watching UHF for the first time in years (my wife had somehow never seen it) is how effectively it creates quasi-narrative opportunities for Al to do his parodic thing. The film is riddled with tangential scenes that stray from the main narrative without cutting themselves off from it entirely. Many of the funniest scenes — the ones in which, not so coincidentally, Al does some of his most thorough parodies of songs and movies — are framed as dream or fantasy sequences, TV commercials or other such “sidebars,” yet they always manage to contribute to the film’s overall storyline. I wouldn’t exactly call the integration of these scenes “skillful,” since in several cases it's carried out in downright clunky fashion. It was not the seamlessness of these scenes’ integration that impressed me on rewatching UHF, but their plenitude and the ways in which each of them reinforces “Weird Al”’s star persona. That’s true even of the scenes in which Al himself does not appear. UHF uses its setting — a struggling UHF television station — as a “natural” excuse to go on these narrative flights of fancy. Because what does a TV station do? Air TV shows. And what are those TV shows like? We’d be glad to show you — and, along the way, you can see commercials and other stuff, too! In this way, UHF’s central plot device is akin to those of hospital-based TV shows such as “ER” and “Grey’s Anatomy.” A single setting, populated by a steady cast of characters, welcomes an endlessly variable stream of new guests and plotlines. Just as there’s no shortage of medical ailments, so there’s no shortage of ideas for TV shows — especially the bizarre ones in UHF. It’s the perfect premise for a parodist of mainstream pop culture such as Yankovic. Which lucky kid will get to drink from the firehose?? But UHF goes beyond this premise to permit further tangential explorations. 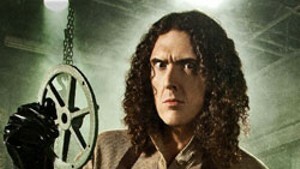 Yankovic, as main character George Newman, plays a daydreamer who loses job after job because he’s always off in his own world. Several of the funniest scenes in the film are these daydreams, which have a somewhat sketchy connection to the film’s overall narrative. That is, such scenes are narratively justified by their characterization of the protagonist, but their actual content (discussed below) is typically only tenuously connected to the film’s main story. Other tangents are better integrated. Even though the glimpse we get of the show “Wheel of Fish” is only a brief one, it’s an important moment in the film. For one thing, it shows that Newman is a kind man, because he has hired his friend and neighbor, Kuni, as the show’s host. For another, it illustrates the kind of nutty-but-appealing content that makes Newman’s station, Channel 62, so popular with audiences. (This needs to be established because, in the film’s climax, the station’s loyal fans keep it afloat by buying shares.) Most importantly, perhaps, the aforementioned kindness and nuttiness are central to Al’s persona. He’s a nice guy with a goofy sense of humor — and those qualities are evident even in parts of the film where Yankovic does not appear. One of the aforementioned dream sequences has Newman effectively become Weird Al Yankovic. With the thinnest of narrative provocations (Newman falls asleep as an episode of “The Beverly Hillbillies” plays on a nearby television), UHF enters his mind, showing us that his dream is … a “Weird Al” video. Specifically, Newman “dreams” Yankovic’s bizarre, inspired mash-up of Dire Straits’ hit “Money for Nothing” and the "Hillbillies" theme song. The dream is effectively a stand-alone video for the song — indeed, the video aired on MTV back in the day. It's a pitch-perfect parody of both the “Money for Nothing” video (right down to Mark Knopfler himself playing guitar on the tune) and of that rather unexciting show that has become a pop culture touchstone. This “mental music video” is the perfect example of a UHF scene whose content has absolutely no bearing on the film’s story, even though its existence is justified by its exploration of an important element of George Newman’s personality. The scene exists to reinforce the star’s extra-cinematic persona as a pop culture parodist; as such, it’s narrativized only to the barest extent. For me, one of the funniest such scenes is the mock commercial for the absurdly hyperspecific store Spatula City — a scene in which Al does not appear. Al may not appear in this hilarious scene (I love the idea of a “Bar Mitzvah” section in a spatula store), but its comedy is entirely in line with his own. It’s over-the-top, it’s gently mocking without attacking anyone or being too pointed, and it’s really, really silly. 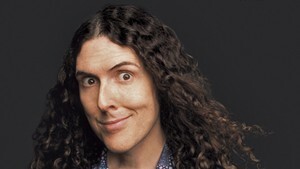 That’s “Weird Al” Yankovic all the way. I’d stop short of calling UHF a “vanity project” or anything of that nature. But, in viewing the film for the first time in at least 10 years, I’m impressed by just how comprehensively it serves as Yankovic's “star vehicle." “Weird Al”’s album Mandatory Fun reached No. 1 last year, and the case could be made that he’s more popular now than he has ever been. So, Hollywood, where’s UHF 2? And, while you're at it, where's the spatula?